My last post on the Nautilus II featured the start of an interesting trend in Hamilton watches, that being reusing names with a roman numeral at the end. That trend was started in the mid 1950's - 1955 to be exact. Often a "II" model was introduced along with a similar, but different "I" model. Sometimes there was even a "III" model. In fact, in the case of the Stormking models, the numbers went all the way to "XI" (11). Another roman-numeral model family was the Guardsman. There are three, the Guardsman I, II and III. 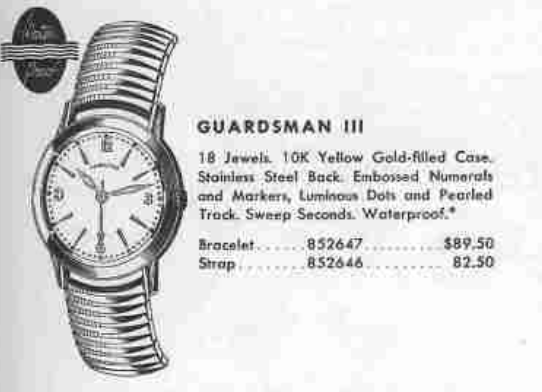 The Guardsman III was only produced for a single year - 1956. I'm a little surprised the Guardsman III was only produced for a single year but maybe it's early demise was caused by it's added cost. Of the three models, the III was the most expensive (on a strap, anyway). Part of the reason for the Guardsman III's cost was it came in a 10K gold filled case and featured the American made, 18 jewel 735 movement. Swiss-made grades in rolled gold cases offered a lower price point. The Guardsman III did cut some corners though, as it was outfitted with a little with an embossed dial and not the typical sterling silver dial with solid gold markers that you'd normally see on Hamilton's standard high quality models. I recently purchased a Guardsman III project watch. As received, I was a little concerned that it may be a little too far gone to be resurrected. I was pretty sure the best I might get out of it was a spare movement. The case wasn't too bad though - so I figured a good cleaning was worth a shot. The 735 is an excellent movement and was introduced in 1955. It's basically a shock-jeweled version of the 748 that was introduced in 1947. The movement ring in this one is a first for me. I've seen this style before but not in authentic models... mainly in "jobber" cases where a jeweler recased a movement in an aftermarket case. It seems to fit okay, but I don't know if it's original. The inside of the case back is clearly stamped so you know this watch is the "real deal". A jobber case would not have any of this "Hamilton Watch Co" information stamped inside. Even with a slightly blurry photo, you can see that this watch's hands have seen better days. The dial is super dirty and it's an old refinish. The little circles in the center of the dial are from the dial being loose and hitting the hour hand. The first thing I'll do is see if I can clean the dial up. If that goes well the rest of this project should be a breeze. These 8/0 sweep second grades are terrifyingly difficult to reassemble, thanks to the four-wheeled train bridge and four very long arbors to align. You have to get all four wheels lined up in order to put it back together. I don't have any problems with it now - but way back when I started this hobby I broke more of these movements than I care to count. While everything is being cleaned I will get out my lume kit to redo the hands and dial dots. Fresh lume is floated across the back of the hand, almost like how soapy water is applied to a ring when blowing bubbles. If you do it right, you don't get any on the top of the hand. Once the lume dries, it will be nice and hard. Everything cleaned up nicely and is ready to be reassembled. This is the angle that I peek into the movement when I tweak all the wheels and get the pivots lined up on the train bridge. When everything is lined up correctly, the bridge will fall into place. The now running movement goes onto the timer. It's running over a minute fast but the beat error and amplitude is great. A little tweak to the regulator brings the beat rate right in line. Well, I have to admit that this watch turned out way better than I thought it was going to. A new crystal and ostrich strap complete the overhaul. There's not much I can do about the rings the hour hand made on the dial but I don't thing they are terribly distracting. The fresh lume on the hands, including the second hand really make the watch pop. Here's a slightly darker exposure to show how they glow in the dark, including the dots at the hour markers. 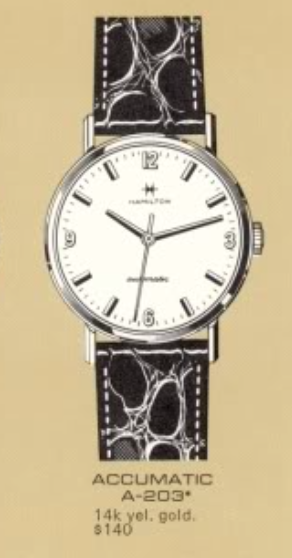 Here's an interesting bit of trivia... a lot of people don't view the Hamilton Illinois watches from the 1950's as "true Hamiltons". At the same time, people don't view them as "true Illinois" models either. I guess they are red-headed stepchildren. Personally, I view the 1950's Illinois models as true Hamiltons and they represent an important time in Hamilton's history. 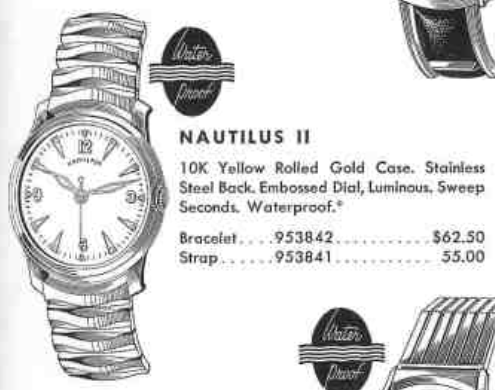 I think Hamilton viewed them as true Hamiltons too - and the reason I say that is one of the Hamilton models from the late 1950's was named the Nautilus II. The original Nautilus was a Hamilton Illinois model. Naming the Nautilus II a "II" essentially declared the legitimacy of the Nautilus as Hamilton model. The Nautilus II was officially a 1957 model and produced for two years. It was preceded though by the Nautilus II B in 1956. The "B" model used leftover Hamilton Illinois movements from 1954 and 1955. There are a number of B models in 1956 that did the same. The Nautilus II was part of Hamilton's entry-level line of fine watches that used rolled gold plated cases with stainless backs along with Swiss-made movements. 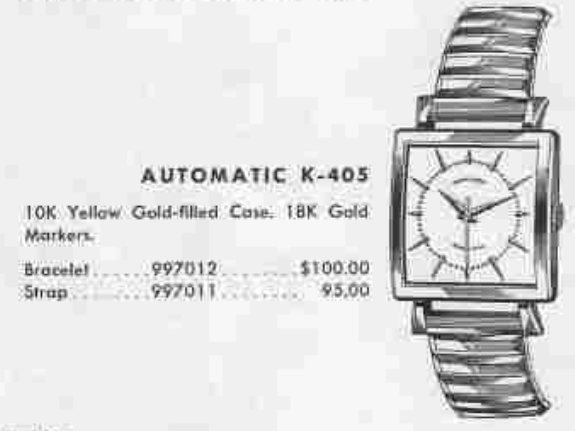 This line-up of models was meant to compete at a lower price point against similarly equipped brands like Elgin, Benrus and Bulova, among others. The Nautilus II came with a white dial with embossed gold numerals and markers. Luminous hands and dots on the dial completed the aesthetic. The catalog shows the model with lozenge-style hands although they aren't always what you see. Hamilton sometimes used what was available, and not just what the design called for. Tucked inside the watch is a Swiss-made Hamilton 671... aka an A Schild 1200. It's a very common 17 jewel grade found in most sweep second hand manual wind models with Swiss movements from the 1950s. I recently picked up a Nautilus that was in great shape - other than a scratched up crystal. Everything appeared to be original. The case back is unengraved and screws off. Other than a little verdigris on the yellow gasket, the movement is bright and shiny. I'll give the movement a thorough cleaning just the same - as I do every new watch I pick up. The dial looks very good and appears to be totally original. There's a very faint radium burn between the 8 and 9, probably from the hour hand not moving for many years. Everything is completely disassembled, cleaned and dried before being reassembled with fresh lubrication. Four different lubricants are used on these Swiss movements... two different oils for the jewels and a grease for the mainspring and another for the setting parts. The reassembled movement goes onto the timer.... let's see how it's running. Well, it took a little tweaking but I eventually got the watch to run just as it should. Since the watch has a central sweep second hand, I'll need to put a high dome crystal on the bezel. My go-to choice for these applications is a GS PHD style and the measurements require a 27.9mm diameter. With a new strap and new crystal, this Nautilus II turned out fantastic. The polished case makes it almost look new old stock. This watch is definitely deserving of some wrist time now. It's hip to be square... as Huey Lewis would say. Most Automatic watches are round. I guess you can do a lot to jazz up the design of a round watch and make it unique. For example, you can add funky lugs or an embossed dial, put steps on the case, or use a reflector ring, etc. However, there are a few, albeit a very few, automatics that are not round, but instead square. In fact, I can only think of a couple, that's how few there are. One of them is the 1956 Automatic K-405. It was produced for three years. The K-405 is a grand watch, in my opinion. It's fairly big and chunky since it has to fit a round automatic movement and has room to spare in the empty corners. The K-405 came in a 10K yellow gold filled case with a silver dial and solid gold markers. The dial is flat in the center and slopes down to the edges - which is an interesting effect. Since the shortest distance from the center to the outside edges is at the 12, 3, 6 and 9 positions, the hands on the K-405 appear to be shorter than typical. I think that's a bit of an illusion though the second hand is definitely shorter in order to line up with the pearled track inside the markers. Tucked inside the two-piece gold filled case is a 17 jewel Hamilton 661 movement. This particular grade was a workhorse in Hamilton's earliest automatics and is in most of the Automatic K-series watches. I recently scored a K-405 and was very happy because it's the only K-series watch that isn't round. The other square auto is a Thinomatic, the T-401from 1959. As received, my project watch was in decent enough shape. It had a new crystal but the dial inside was a yellowish green color... a subtle clue that this watch is a victim of a few decades of second hand smoke (it's probably nicotine on the dial). The back of the case is in great shape and it snaps on tightly. This is the first automatic I've seen where the movement sits in the case back without being a front-loader. The 661 is clean and bright. I don't know when it was last serviced, so I'll do it anyway just so I know there's fresh lubrication inside. Clean doesn't mean lubricated. All the parts are cleaned and ready to be reassembled. I was able to clean up the dial pretty well and revealed the original butler finish underneath the grime. Without the oscillating weight attached, the reassembled movement is basically a manual winding movement. It's all back together and running so next stop is the timer. Uh-oh. Something inside is making some noise. It could be some lint on the hairspring or the hairspring hitting something while its running. Re-cleaning the hairspring solved the problem. I'd never know I had an issue if I didn't have a timer... it's one of the most important tools in the arsenal. A little tweaking to the regulator brings the beat rate right in line. The beat error and amplitude are great too. The rotor goes back on, as well as the dial and hands and it all snaps cleanly back into the case again. I relumed the hands since the rest of the watch is very clean looking now. What an improvement the brighter dial is! I got lucky on cleaning this one... they don't always go this well. One interesting bit of trivia about Hamiltons are all the watches where two models look very similar but the case materials are different. For example, earlier in the month I showed off the 14K Gilbert and last month it's 10K cousin, the 1953 Gilmore. The two models look almost identical except the later model is 10K and not 14K. Hamilton did something very similar during WWII, when it introduced a 10K gold filled Cushion that looks very similar to the earlier Cushions from the 1920's - except the case isn't 14K gold filled. Another example is the 1953 Brockton. Like the Gilmore, it mimics an earlier 14K watch called the Brock. The names are so similar, you know the model design was purposeful. The Brockton was produced for two years. 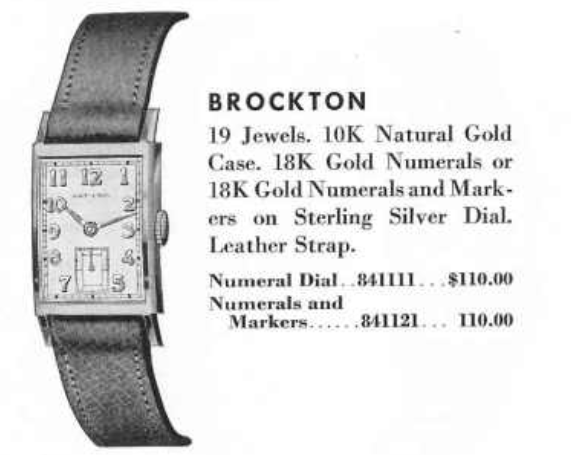 The Brockton came with either an all numeral dial or a dial with markers and numerals too. Under the dial you will find Hamilton's 12/0 sized replacement for the 982M movement, the 19 jewel 754 movement. Like the 982M, the 754 was specially made for solid gold models. It wasn't produced for long though - as all of the 12/0 sized movements were replaced by the 22 jewel 770 movement when it was introduced in 1955. I recently purchased a Brockton because I liked the engraving on the back. As received, it was a little beat up and dirty but the biggest issue was it wasn't running. I thought the engraving was very nicely done... I wonder what Abraham Butnik did to be recognized for his leadership? Without the scratched up crystal in the way, I can tell that the dial is original and is in excellent shape. The 754 movement looks a lot like the 770 movement and shares a lot of the same parts. The balance on this movement is fine so I suspect it's just dirty. Certainly the haze on the metal would indicate it's been a while since it's been to the spa. The inside of the case back is stamped with the model name and makes identifying the model very easy. You will often find the 12/0 movements incorporate a spacer plate. One of the trickiest parts of reassembling the watch is remembering how to line of the spacer plate when you put the dial back on. The glass crystal is scratched up and will need to be replaced. Just a little light sanding on the edges with 600 grit paper will shape the new crystal enough to drop into the bezel without any force being applied. UV glue will hold it in place. Everything is laid out and ready to be reassembled. It took just a little tweaking to the regulator to bring the timing the of the watch right in line. A new strap completes the restoration. The Brockton isn't a very large watch but it is a smidge bigger than the Brock. Here's another shot of the case back. The engraving looks even better with a light polish.